Do You Have Mold In Your Basement? It’s not uncommon to find mold in basement since basements are often damp places. In addition, many people don’t spend much time in their basement, so they might not notice mold is growing there until the problem becomes severe. Basement mold removal can be difficult, so prevention is important. There are a number of things you can do to help prevent basement mold. Use a dehumidifier if the basement feels damp or smells musty at all. Check for leaks around any basement windows and make any needed repairs as soon as possible. If you have a washer and dryer in the basement, make sure there are no leaky pipes or hoses and that the dryer is properly vented to the outdoors. Make any needed repairs as soon as possible. If your hot water heater is in the basement and is getting old, monitor it for leaks. The average lifespan for a hot water heater is 8-12 years. Here is more on the signs of a hot water heater leak. If you have a bathroom in the basement, make sure there are no leaks around the toilet or under the sink and make any needed repairs as soon as possible. If you find mold growing elsewhere in the house, deal with it as soon as possible. Most kinds of mold spread quickly and easily and a mold problem that starts upstairs can soon end up causing problems in the basement, as well. Sometimes, despite the best efforts at prevention, homeowners end up with mold in basement. 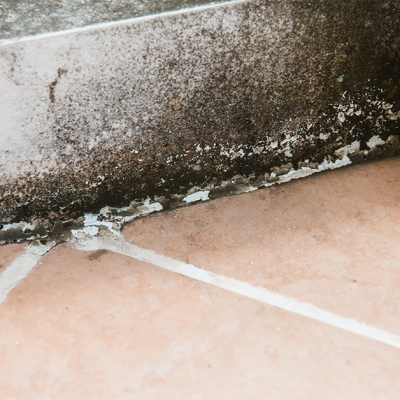 Basement mold removal may be a simple process or a complex one, depending on the extent of the mold growth and the types of surfaces on which the mold is growing. If your basement has concrete walls and a concrete floor, mold can usually be removed with an antimicrobial cleanser like Foster 40-80 and a scrub brush. If you have a finished basement, though, and there is mold on drywall or on carpet, it won’t be so simple. It’s almost always impossible to remove mold completely from porous surfaces, including drywall, carpet, and ceiling tiles, because the microscopic mold spores get inside the microscopic pores in the materials and even when you clean the visible mold from the surface, some mold spores remain. Those types of materials must be removed and replaced with new, mold-free materials. If you have trouble with dampness in your basement, we recommend replacing carpet with another type of flooring, such as linoleum, instead, because it will be easier to keep that dry and if it does get moldy, it will be easier to clean. Materials that cannot be adequately cleaned, like drywall and carpet, must be carefully removed and replaced. Before beginning the process, the work area should be sealed off with heavy sheets of plastic to prevent mold spores from spreading to other areas of the home. Materials should be sealed in plastic trash bags before they are carried out of the home. It’s important to wear safety gear, including an N-95 respirator mask, during mold in basement removal to prevent exposure to mold spores that can make you sick. If you have questions about removing basement mold, you can schedule an in-home consultation with a mold removal professional @ (419) 297-6138.